Lal Kitab and astrology differ on one major basis that is the kundli prepared and the postion of planets in both the kundli. Lal Kitab do not consider the planet is in which house number rather than it consider in which house it is positioned. One peculiarity of Lal Kitab is that the Rasis are not taken into account. The numbers of Rasis which are taken to be identical with house numbers are only important. a) While the conventional Hindu school of astrology is based on many voluminous works by our rishis and munis; the Lal Kitaab is a single treatise written in old Urdu , with no mention of authorship. There are many theories on the reasons behind the author choosing to stay anonymous. The most popular of these theories being that perhaps due to Divine instruction, the author was not interested in taking credit for the work. Coming back to astrology, the most famous and perhaps the most respected of the works it is based on is the Brihat Parashara Hora Shastra , written by the great sage Maharishi Parashara. In view of this, the conventional Hindu school of astrology is frequently and justifiably referred to as the Parashari system of astrology. b) The Parashari system is one of pure astrology and refrains from even mentioning other methods of divination (foretelling) such as numerology and palmistry. This could be understood in light of the fact that astrology, palmistry and numerology have progressed in Indian sub-continent as independent, unrelated and hence competitive sciences. In contrast, the Lal Kitaab is a treatise on astro-palmistry; astrology and palmistry complement and supplement each other instead of competing and deleting each other. For example, in Lal Kitaab , if the sun is in the second house of a native’s horoscope, he must possess a certain kind of sun-line in his palm. Since the hand is always available, the horoscope can be verified and even cast on the basis of the hand’s print, called a palmoscope, for brevity. c) In Parashar Hora, the determining inputs for prediction are the the birth chart, the influencing periods or dasas as they are called and the transit movement of planets called the gochar. 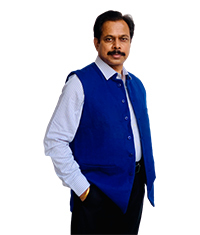 Indian astrology is unique in having the dasa system, the most popular of them being the Vimsottari dasa system. The Lal Kitaab refers only to the birth chart, and its own unique number chart to cast the Lal Kitaab varshphal (literally means yearly fruit) or yearly chart of the native. Predictions are made on the basis of the birth and the yearly chart cast. Needless to mention, Lal Kitab does not believe in the dasas and the gochar. d) While in the Parashari method, the Sun is regarded as the king of all planets and hence the most important factor in the horoscope, in the Lal Kitaab , Jupiter or Deva Guru Bhrispati (the preceptor of all gods, including the Sun ) is given the supreme status. e) Interpretations of placement of planets in rashis and houses vary greatly in both. For example Jupiter in Cancer in the first house is regarded as excellent by Parashar pundits while the Lal Kitab considers this placement as average. Instead the best house for Jupiter is second and not the first, and Cancer is not the best sign for it. Similarly Pisces for moon is bad and Scorpio for moon is good in Lal Kitab ; the last part will amaze many because in Parashari school moon is debilitated in Scorpio. 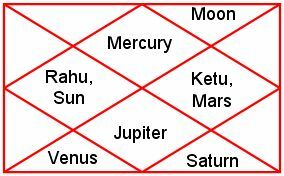 The horoscope chart for the Lal-Kitab astrology can be derived from the vedic horoscope charts. 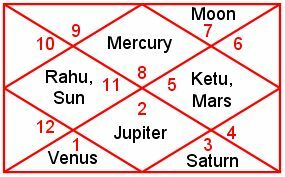 The vedic horoscope contains the twelve houses and the location of the planets in to different houses. Each house is also assigned a number that represents the zodiac sign. It represents the position of planet in a particular zodiac sign at the time of native’s birth. 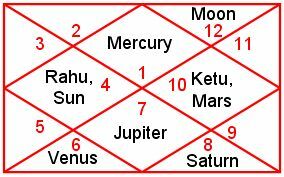 The example of the vedic horoscope chart is shown below. The first house is called the “lagna” and the zodiac sign in the first house will be called its lagna sign. So the total twelve lagans will be possible in vedic astrology. Here in above example the lagna is Scorpio as the number 8 is written inside the first house. The Lal-Kitab astrology does not give weight to the lagna. It assumes that all the native in the World will have one lagna only and that is “Aries”. So to create a horoscope as per the lal-Kitab astrology, remove all the numbers from the vedic horoscope chart as shown below. Now re-number each house starting from the first house as shown below. The lagna will be "Aries" for all the natives as per the Lal Kitab astrology. Now the horoscope chart is ready for the analysis as per the Lal-Kitab methodology.